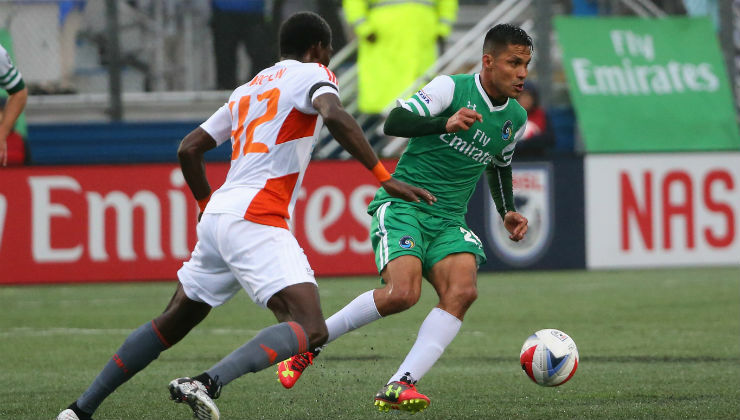 The New York Cosmos and Carolina RailHawks each enter Saturday’s contest on the heels of a last-minute victory in Week 8. New York (6W-2D-2L, 20 points) snatched a 2-1 road win over Puerto Rico FC thanks to a late winner from El Salvador international Andres Flores, while Carolina got a stoppage-time goal from Mexican star Omar Bravo to notch a 3-2 win over Spring Season Champion Indy Eleven. Both sides should step onto the field with confidence on Saturday night, but if history says anything, the Cosmos will be tough to topple at home. Giovanni Savarese’s side has yet to lose a game at Shuart Stadium this year, and that run includes a 1-0 win over the RailHawks in the Spring Season. The RailHawks (3-3-3, 12) come to New York with the red-hot strike partnership of Bravo and Matt Fondy, though. The two forwards have combined for eight goals (four apiece) since teaming up after Bravo’s arrival on July 22.